Here is a listing of just a few of the infinite possibilities you can explore to create an experience that is unique to your personal interests. Each year, AmeriCorps offers 75,000 opportunities for adults of all ages and backgrounds to serve through a network of partnerships with local and national nonprofit groups. Opportunities include: tutoring disabled or disadvantaged youth, build affordable housing, clean parks and streams, and many more. 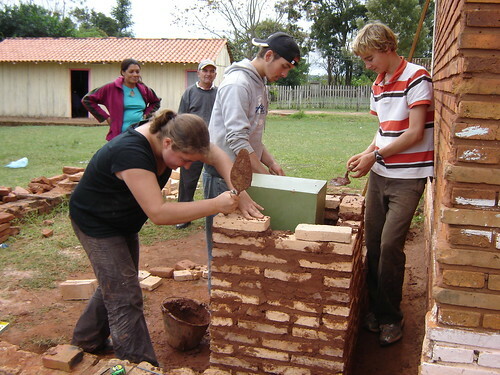 AMIGOS inspires and builds young leaders through collaborative community development and cross-cultural summer and gap year programs in Central and South America. Accredited by the Gap Year Association, the AMIGOS Gap Year Program provides immersion and leadership experiences. Students complete an internship with a local organization, live with a host family, implement a sustainable service project, and go on excursions to amazing local spots. Since 1947, CIEE: Council on International Educational Exchange, has been in pursuit of its mission, "to help people gain understanding, acquire knowledge, and develop skills for living in a globally interdependent and culturally diverse world." Our volunteer programs are unique in every way. Our global infrastructure supports thousands of international volunteers each year and over 250 sustainable community initiatives. More than 250 CCS in-country staff members are working year-round, ensuring that you are volunteering with a project that interests you and is contributing directly to the goals of each community. No other short-term international volunteer program has such a global presence and community-centered approach toward volunteering abroad. "Opening the world through education." For 50 years this organization has provided opportunities for global education through programs to provide confidence and freedom to people of all ages, nationalities and backgrounds. El Casal offers gap semester programs in Barcelona, Spain combining travel, excursions and day trips, Spanish language courses, cultural activities, community service and cultural exchange opportunities. FSD partners with more than 300 community-based organizations throughout Asia, Africa, and Latin America to support sustainable change. Our development model relies on active community participation to mobilize lasting solutions. While respecting local value systems, we partner with local leaders to build networks and collaborate on community-driven approaches to development issues. Gap 360 offers 200 trips in 50 destinations. Activities are offered all over the world, and include paid work, volunteering, adventure trips, group tours, learning and development trips, and round the world trips. The purpose of Gap 360 is to provide affordable gap year travel opportunities to a wide range of travellers. Go Overseas provides reviews and reliable information on every gap year program in the world. Compare programs, read peer reviews, look at photos, read articles, and find the best gap year program for you. Global Citizen Year recruits, trains, and supports a diverse corps of high school graduates to engage as apprentices in Asia, Africa, or Latin Americaduring a transformative year before college. GCY Fellows spend 10 months in an intensive fellowship learning a new language, becoming integral members of a community, and working on the frontlines of today's global challenges. In collaboration with top universities, business and social sector leaders, Global Citizen Year provides its Fellows with ongoing training in leadership, global development, and social entrepreneurship. Fellows return with the critical perspectives and skills needed to succeed in college and beyond. Learn Mandarin and experience history and culture through a gap year in China. Live the Language offeres four programs for students on a gap year. NGOabroad is a unique service that helps you enter or advance in international humanitarian work & provides frugal, customized international volunteer opportunities. TBB’s Global Gap Year and Ecuador Gap Semester are designed for students who are serious about creating change. Each program immerses you in communities around the globe to learn about the world’s greatest challenges. By living with multiple home stay families, exploring a variety of topics, and engaging in a powerful curriculum, you’ll gain knowledge of both local issues and global solutions. As part of a group of 16 students and 3 teachers, you’ll receive structured mentoring to become a proactive agent of change. Dragons programs are authentic, rugged and profound learning adventures that expose the beautiful and complex realities of the countries in which we travel. Featuring extended itineraries, Dragons programs encourage deep immersion into strikingly different physical and cultural landscapes, combining the best in experiential education, travel, service learning, and physically and intellectually challenging experiences. Earthwatch expeditions are ongoing research projects confronting critical, current issues, run by qualified and respected members of the scientific community. Topics span a wide range of scientific study including climate change, endangered species, history of civilizations, sustainable development, and the state of the oceans. The High Mountain Institute is a small, educational non-profit located in Colorado. Programs combine wilderness education with intellectual inquiry. The HMI Gap is a semester of adventure, exploration, and conservation in the rugged American West and wild Patagonia. The semester integrates a high-level rock climbing and wilderness curriculum coupled with environmental field studies and service. A non-profit educational organization teaching technical outdoor skills, leadership, and environmental ethics. Courses range from a few weeks to an academic year in locations from Wyoming to Mexico to India. Middlebury College’s School of the Environment is a 6-week summer environmental studies program in Vermont which combines traditional course work, field studies, and leadership training to help students prepare for a life of meaning. The program combines one of the best environmental studies programs in the United States with our renowned intensive summer program methodology. Guided by national environmental leaders, students receive environmental leadership training and build a tool kit of career skills. Students collaborate in research teams to work on real world sustainability challenges. VYCC offers a 20-week (late June-mid Nov) experience living and working on the VYCC farm in Richmond, VT. In addition to farm work, participants are involved in leadership training as well as efforts to alleviate hunger for local families in need.